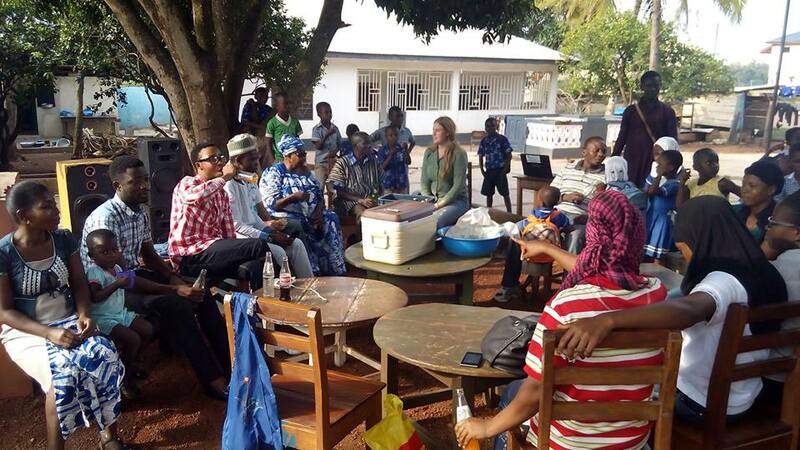 For One World, a US-based nonprofit organization, is seeking to award two travel grants to teach at the Ayi Owen International School in Techiman, Ghana, West Africa over the 2019 Summer. This is an excellent opportunity to gain international experience teaching in English at an innovative school in a developing country. Travel grant winners will be provided with a shared apartment on the school compound with access to running water, bathrooms, kitchens, tennis, volleyball and basketball courts plus broadband internet via Wifi. Cost of accommodations at volunteer quarters is covered by For One World (value of $500). 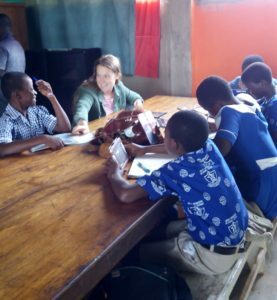 The Ghanaian founder and her American spouse have developed the school over the past twenty years that uses interactive instruction, hands-on projects, and interdisciplinary lessons and online mathematics to prepare students to excel on the Ghanaian national middle school examinations. Travel grant winners will have opportunities to meet chiefs and high-ranking members of local government as well as explore the local culture, music, religions, health centers and markets. While the involvement with the school is the first priority, grant winners are welcome to pursue additional projects with a broader impact, as well as make short trips to visit exciting destinations throughout Ghana. Eligible candidates must be attending an accredited university as a full-time student or be a recent graduate. All degree levels will be considered. International experience is not required but an open mind and a willingness to experience new cultures is a must! The travel grant is provided in association with the Techiman Learning Resource Centre and the Ayisatu Owen Schools Llc. Up to two travel grants are offered for a 2-3 month duration departing for Ghana in May/June 2018. Each candidate’s arrival date in Ghana needs to be aligned/coordinated such that transportation is shared from the airport to the school. The grant application deadline is February 27, 2019. Grant winners and one “runner up” will be notified by March 6, 2019. Grant winner(s) is required to accept or decline by March 13, 2019. If a grant winner declines, the “runner up” will be notified. Candidates should email this application page and the related personal statement to travelgrant@foroneworld.org or complete the application online by February 27, 2019 in order to be considered. (2) Write one to two pages about why you would like to volunteer at Ayisatu International School and which of the seven potential projects described below you would be most interested in, should you be awarded the scholarship. You may write about more than one project. You are also welcome to propose a project not listed below. More often than not, volunteers are involved in multiple aspects of improving education of the students and teachers in and after school. You will have opportunities to meet chiefs and local government officials. Your involvement with the school is the first priority, but you are welcome to propose additional projects with a broader impact, i.e., public health, town sports, environmental protection, IT consulting. Hands-on science projects to provide the children with first-hand experience on the beauty of finding facts and the art of experimentation. Computer curriculum needs integration with classroom learning. Online materials and CDs for math, English, and other subjects are currently being used but not yet integrated effectively to the school curriculum. Fresh ideas on how to integrate computers and smart phones into primary school learning are needed. Training for Microsoft Office applications is needed for students and teachers (Excel, PowerPoint, Word, etc.) as well as improved instruction in keyboarding. The grant application deadline is March 27, 2018. Grant winners and one “runner up” will be notified by April 3, 2018. Grant winner(s) is required to accept or decline by April 10, 2018. If a grant winner declines, the “runner up” will be notified. Candidates should email this application page and the related personal statement to travelgrant@foroneworld.org by February 27, 2018 in order to be considered. For One World Volunteers Ends Their 2 Months Stay in Ayisatu Owen International School, Techiman Campus. Last Friday, our two For One World volunteers from this term, Jasmine Mack and Sarah Williamson ended their two months stay in Ayisatu Owen International School, Techiman campus. The School organised a send off party for the two to mark the end of their stay. 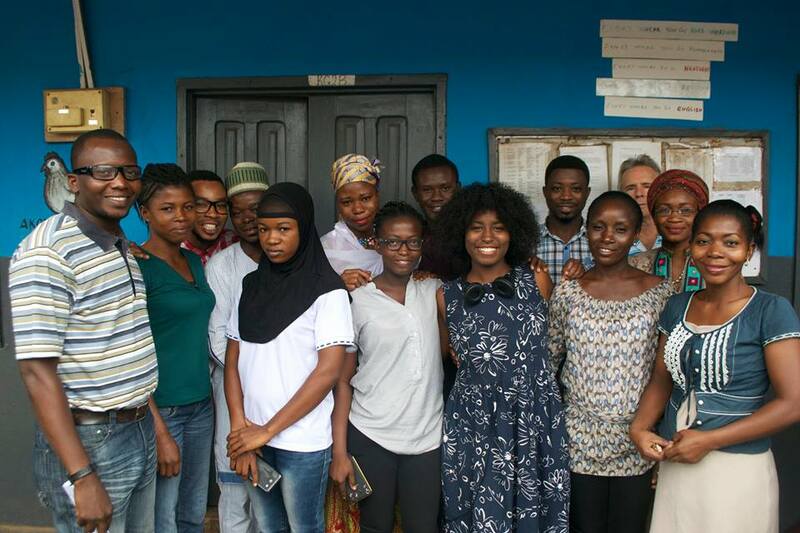 Jasmine Mack (middle, For One World Volunteer) in a group photo with teachers of Ayisatu Owen International School. 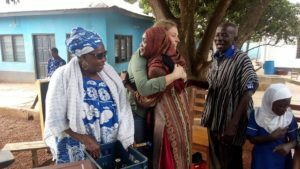 Sarah Williamson hugging Sadia Inusah (School Librarian) with them are Mrs. Ayisatu Owen (Co-founder of the school) and Mr. George E. Badu (Headmaster). We are grateful for what our volunteers had to offer the pupils and teachers. Thank you Sarah and Jasmine! Jasmine Mack (For one world volunteer, below) helping out a group of students researching on E.T. Mensah a famous Ghanaian Highlife musician during their research drive. Sarah Williamson (For one world volunteer, below) assisting students researching on Martin Luther King Jr. during their Research Drive. 2016 For One World Travel Grant Program – Deadline Extended to March 10th! For One World, a US-based nonprofit organization, is seeking to award two travel grants to teach at the Ayi Owen International School in Techiman, Ghana, West Africa over the 2016 Summer. This is an excellent opportunity to gain international experience teaching in English at an innovative school in a developing country. Travel grant winners will be provided with a shared apartment on the school compound with access to running water and internet. The American founder and his Ghanaian wife have developed the school over the past ten years to emphasize Western teaching techniques (interactive instruction, hands-on projects, and interdisciplinary lessons) to prepare students to excel on the traditional Ghanaian standardized tests. Travel grant winners will have many opportunities to meet Chiefs and high-ranking members of local governments as well as explore the local culture, music, religions, health centers and markets. Up to two travel grants are offered for a 2-3 month duration departing for Ghana in May/June 2016. Each candidate’s arrival date in Ghana needs to be aligned/coordinated such that transportation is shared from the airport to the school. The grant application deadline is March 10, 2016. Grant winners and one “runner up” will be notified by March 17, 2016. Grant winner(s) is required to accept or decline by March 24. If a grant winner declines, the “runner up” will be notified. Grant winners are required to document their trip and create a journal/essay of their experience and submit a final summarizing report. All successful candidates’ essays and follow up research may be posted on the For One World’s website. few physical education programs other than soccer. For One World reimburses the grant winners for $1000 of the flight (after the grant winner purchases and provides a receipt to their assigned For One World advisor). Your assigned advisor can help you find a flight. Last year the high season round-trip flights were around $1,800 with British Airways, and nonstop NYC to Accra via Delta is available for about $200 more. A chef is not included with the volunteer housing! After welcome meals the grant winners are expected to cook their own meals while at the volunteering housing and do their own shopping either at convenient stores or the local organic food market. During your first week, you will be escorted to the markets to help you get acquainted with the basics of buying food. It is important that volunteers have basic skills to be able to shop and cook meals. Reputable restaurants are not as readily available as in the USA or they are costly. Volunteers can also make arrangements for the washing and ironing of clothing, some of which you should acquire locally, i.e., tie and dye cotton prints. Candidates should email this application page and the related personal statement to travelgrant@foroneworld.org by February 26, 2016 in order to be considered. -Candidate must be attending an accredited college/university as a full-time student or be a graduate. All degree levels will be considered. -Retired teachers and professionals are welcome to apply. Please indicate on your application that you are not currently attending college. Math program could be improved by giving more attention to games, methods, and exercises. In addition, a math lab program needs to be designed and organized to supplement the current lecture format. This effort should focus on 3rd – 7 graders. 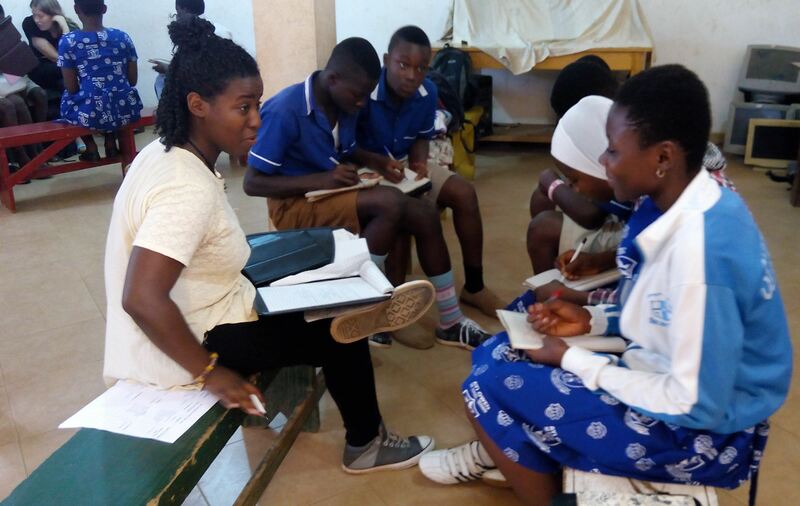 For One World, a US-based nonprofit organization, is seeking to award two travel grants to teach at the Ayi Owen International School in Techiman, Ghana, West Africa over the 2015 Summer. This is an excellent opportunity to gain international experience teaching in English at an innovative school in a developing country. Up to two travel grants are offered for a 2-3 month duration departing for Ghana in May/June 2015. Each candidate’s arrival date in Ghana needs to be aligned/coordinated such that transportation is shared from the airport to the school. The grant application deadline is February 27, 2015. Grant winners and one “runner up” will be notified by March 13, 2015. Grant winner(s) is required to accept or decline by March 20. If a grant winner declines, the “runner up” will be notified. Candidates should email this application page and the related personal statement to travelgrant@foroneworld.org by February 27, 2015 in order to be considered. Up to two travel grants are being offered for a 11-24 week duration departing for Ghana in May 2014. Each candidate’s arrival date in Ghana needs to be aligned/coordinated such that transportation is shared from the airport to the school. The grant application deadline is February 28, 2014. Grant winners and one “runner up” will be notified by March 14, 2014. Grant winner(s) is required to accept or decline by March 21. If a grant winner declines, the “runner up” will be notified. Grant winners are required to document their trip and create a journal/essay of their experience and/or project findings. All successful candidates’ application essays and follow up research may be posted on For One World’s website. $100 of the travel grant reimbursement (flight only, and we only will reimburse up to $1,000 (after we get a copy of the flight itinerary) ) –will be withheld until the winner submits a minimum 3 page report (ie results and product findings) for sharing with the Board of Directors and/or posting on the website at the conclusion of the trip. 2007. Educational situation in surrounding area:·-Majority of basic schools fail to provide qualityeducation. Candidates should email this application page and the related personal statement to travelgrant@foroneworld.org by February 28, 2014 in order to be considered. (2) Write one or two pages about why you would like to volunteer at Ayisatu International School and which of the seven (7) potential projects described below you would be most interested in, should you be awarded the scholarship. You may write about more than one project. You are also welcome to propose a project not listed below. More often than not, volunteers are involved in multiple aspects of improving education of the students and teachers in and after school. You will have opportunities to meet chiefs and local government officials. Your involvement with the school is the first priority, but you are welcome to propose additional projects with a broader impact,i.e., public health, town sports, environmental protection, IT consulting. The TED organization that is known for it’s interesting lectures has started on educational videos with their launch of a YouTube channel called TED Ed. We look forward to seeing what lessons they share!